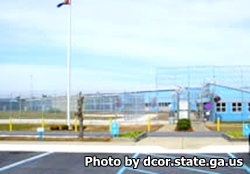 Calhoun State Prison is located in Morgan Georgia, part of Calhoun county. It is a medium security institution which houses approximately 1,677 adult males. Inmates incarcerated at this facility sleep in either a cell with a triple bunked bed, or a cell with a double bunked bed. In addition, inmates can also be held in one of eight open dormitories. If the inmate has disciplinary issues or safety concerns they can be held in segregation which contains isolated single cells.. Inmates can receive education while incarcerated by taking GED courses, adult basic education classes, learn to read, or participate in correspondence courses. Offenders can also get a variety of training in the following vocational skills: Horticulture, barbering, building maintenance, grounds keeping, clerk, sanitation, forklift operator, and culinary services. Visitation is held on Saturdays, Sundays and all State recognized Holidays from 9am-3pm.